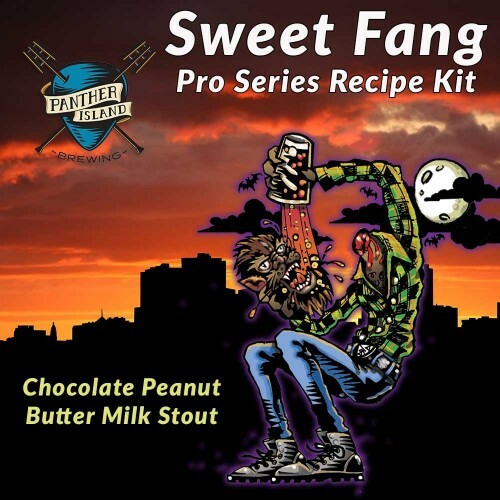 Panther Island Brewing Sweet Fang - Chocolate Peanut Butter Milk Stout - Extract Beer Recipe Kit - Texas Brewing Inc.
Our friends over at Panther Island Brewing here in Fort Worth are awesome, and so is their seasonal release beer Sweet Fang. Lucky for all of us, they have been kind enough to share their recipe! Thanks Ryan! Cacao Nibs, Peanut Butter Extract, and Lactose combine with a rich grain bill to create this delectable Milk Stout. This extract recipe kit is only available for a limited time, so brew it while you can! Panther Island Brewing is a family owned and operated brew pub located on the banks of the Trinity River in Fort Worth, TX. What started out as a passion for craft beer and a fascination with home brewing grew into a full-scale brewery. With the support of friends and family Panther Island became a reality on December 9, 2014. We open our doors to the public Thursday-Sunday and offer a fun, family and pet friendly environment in a climate controlled taproom.